February 10, 2010. Photo credits: Daria Burachek. New York - Yearly ROCOR youth trips, symposiums, camps and conferences held around the world have become traditions that our young people look forward to and encourage their peers to attend. Every summer the Synodal Youth Committee has two different trips planned to Russia. The purpose of the trips is to introduce youth from different parts of the world to different aspects of Russian Orthodox Faith and culture, and for them to be able to meet with like-minded people. A trip to Russia changed the lives of two participants of the Concord of Orthodox Faith forever. Vladimir Bigdan - a 22 y.o. 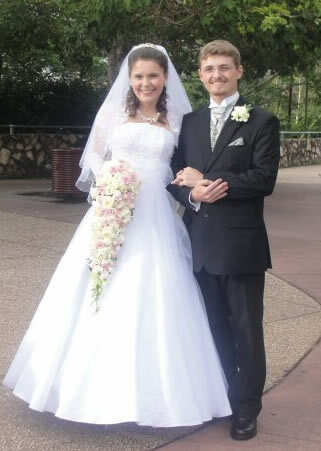 engineer from Brisbane, Australia and Anna Kovaleva – a choir director from Mirniy, Russia married in February 2010 after a short courtship over the internet. Vladimir shared the story with the Fund for Assistance to the Russian Orthodox Church Outside of Russia which sponsored the trip. Fund for Assistance: How did you meet? Vladimir Bigdan: We met at the Concord of Orthodox Youth conference that was based in Kursk in the summer of 2009. I was the choir conductor for the conference’s mixed choir, while she was the director of the Russian delegation choir. Hence we met on a professional basis and hence spent quite some time together. We noticed each other in a romantic sense at the very end of the trip, during the Ball in Maryino Palace. FFA: What was your first conversation about? VB: About the choir, of course! The day after we met we had a big service for the Name's day of Archbishop Herman of Kursk and Rylsk, and our first and foremost responsibility was to prepare for that. Apart from singing (religious, cultural and secular) we share very similar life views, characters and upbringing. FFA: How did your relationship develop? VB: It was gradual, throughout the trip. However the relationship as per se only developed on the 30 July, the day before the trip finished. FFA: How did you know you want to marry her? VB: When you are on the lookout and have been for a few years, you know when everything that you have been looking for plus more is concentrated in that person. FFA: How did you propose? VB: Unfortunately I had to go back to Australia, and we communicated for some time over the internet - both chatting and video conferencing. I proposed over the internet. We both knew all along that we were made for each other. FFA: What did your families say? VB: They were surprised, but very happy for me. Her family were sad that she had to move so far away, but very happy for her. FFA: Where did you get married? FFA: Do you have any advice for young people going on this kind of trips? VB: Well quite obviously it was a life-changing experience in the fullest sense of the word. Of all the places I have been and people I have met, this trip was by far the most rewarding. The advice is to go out there and meet people, learn the way of life, learn from each other. You will find so much heart in the people of Russia that it will be hard to comprehend how you have been without them for so long! I'm deeply thankful for this opportunity; thankful to the Lord in the foremost, thankful to the organizers of the Concord, thankful to all the sponsors who made it possible. Without their help I could not have afforded the trip. I shudder to think of how my life could have turned out. Thank you!